The Malekko Wiard series of modules offer the same great sound, ergonomics, musicality, and quality that made the Wiard 300 series legendary at a fraction of the cost and size in Eurorack modular format. The Borg is a versatile audio processor. 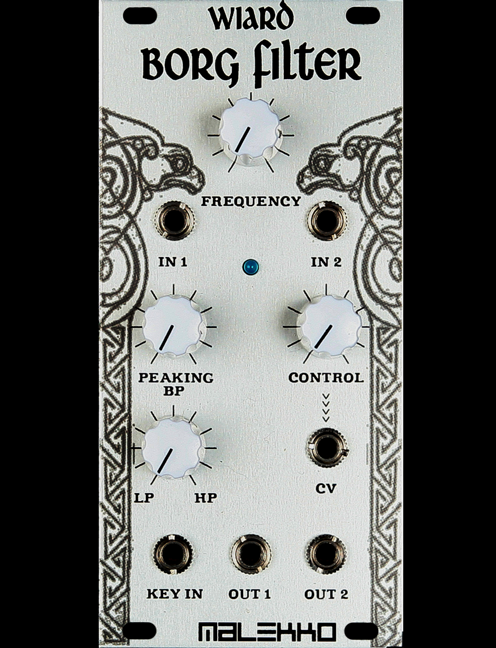 The concept comes from a marriage of two divergent influences, the Buchla 292 Low Pass Gate and the Korg MS20 filter. The Borg is different from most filters in that, at its heart, is a vactrol. Vactrols are combination light sensor/light resistors that possess interesting sonic traits. Often described as “rubbery” or smooth in quailty, vactrols are also know for their relatively slow response. This response creates a natural, very musical decay. In Low Pass Gate (LPG) mode, the Borg will act as a filter and a VCA simultaneously. in combination with the characteristic vactrol response, this creates a signature sound that is desired amongst many synth enthusiasts, especially when used with very short, percussive patches. But the Borg is no one-trick pony, and LPGs are not for every patch. When the resonance knob is turned “on” with a click, the Borg becomes a 12db filter with loads of personality. Gorgeous resonance, influenced by the MS20 and shaped by the vactrol design swells from subtle warmth, to a roaring howl that is unique to the Borg! A continuously adjustable low pass to high pass control is provided (a notch filter is a mix of these two). There are two audio inputs, and two CV frequency inputs (one with attenuation). Two outputs are provided, output 2 has a slightly more aggressive resonance. Removing a jumper on the back of the Borg makes the resonance “scream” even more! The Borg I (white knobs) has a slower response and a more mellow sound compared to the Borg II (black knobs). Thanks to its longer decay time, the Borg I is best for recreating the famous Buchla bongo patch, and the Borg II is best for a faster, more aggressive response. The Borg is 12hp wide, 25mm deep, and consumes approximately 35mA power.